In September, Bill Hillmann gave a Seminar for the Long Point Retriever Club in southern Ontario. I was unable to attend but afterwards Bill dropped by for a few days of training and talk on his way to another seminar in Connecticut. We had ample opportunity to discuss training in the field while we ran our dogs, as well as a chance to compare philosophies, practices and procedures, especially when training alone. This is an excerpt from a 2-hour interview in which we talked about the development of Bill’s training approach and his current philosophy. We started off talking about Bill’s two earlier books documenting some Methods and Concepts of Top Professionals. This brought us to the present and a look at retriever training today compared to the past. 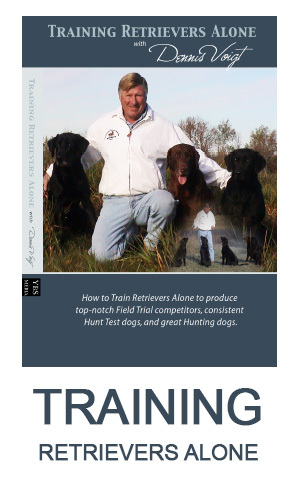 Dennis: You’ve been training retrievers for a long-time – maybe even as long as me! What are some of the biggest changes in the game that you have seen? Bill: Well it’s not just changes in the training, it’s also the breeding. The dogs are different – they are more sensitive. Dennis: That’s a good thing – right? Bill: Yes, and I also think they are intellectually superior – at least since I started (late 70’s), but the training has changed too. At that time, the electric collar began to be the pivot and that became a big factor around 1980. In my book, you’ll find those that liked the collar and those that didn’t. As time progressed there were fewer and fewer that didn’t use it, even though to this day there are plenty that don’t know how to use it! J In the early 80’s, many of the older pros were using it but strictly as a punishment deal and the younger pros were studying it to learn how use in more positive ways. Some were trying to use it for dogs that were more pleasing to look at. But a lot of the younger pros around the early 80’s were experimenting and discovering that they could get dogs to do almost anything with it. But, consequently, some had dogs that were not pleasing to watch. Dennis: Yes, I remember that a large number of the dogs were slow or even walked on a land blind on some circuits. But today, you can watch a hundred open dogs and you might only see two to three walk. Bill: Yes, and let’s face it – that is the biggest change. That is because people have gradually learned how to use the electric collar plus they have learned about procedures to get dogs to learn things – more of a teaching thing. I remember seeing dogs coming to line and there was so much equipment you needed somebody to help carry it – ropes and various shotguns and rat shot and leads and quirts – all sorts of torture items. Frankly, I didn’t want any part of it! I didn’t like it and I thought there were better ways to get as much or more done. When I first got the collar, I had it a short time and I got rid of because I realized I didn’t know how to use it. Bill: About 1980 because I was a professional then. But in another half year, I was using it because I realized I had to learn how to use it. I was trying to use it without a lot of pressure. Dennis: Yes, I recall how little training information was available then compared to today –especially about using the e-collar. I didn’t start using the collar until about 1985 and I recall little other than a couple of books, one by Tri-Tronics, about escape and avoidance training. There was information by behaviourists that trained rats and the theories were extrapolated to dogs. This was all operant conditioning theory and the theory remains solid but the methods we used on dogs weren’t very well developed. There were no videos in those days. A few books, like Charlie Morgan's, James Lamb Free's and D. L. Walters' and Paul Shoemaker's, but not much else. Bill: And none of them dealt with the e-collar. Dennis: None! I got a hold of some early Rex Carr notes and one of his seminar audio recordings and that become very important – more so than anything publicly available. I think there was a long period there for most that was trial and error – emphasis on error! Bill: So back to the biggest changes. One thing you could use to document this was how X-rays in the 70’s would show rat shot in so many trial dogs but by 1990 almost none. That tells you how much has changed. Dennis: Yes, the changes have been for the good. Another thing in those days, most pro trucks had a couple of prods on display. Today that is a rare sight indeed. I am not condemning the methods but simply noting how things have improved. Bill: Agreed – that was part of learning curve. Dennis: Tell me about you personally. What is the biggest change for you and your training? Bill: It is probably how I use the e-collar today. That is, the use of low intensity “nicks” with the collar – perhaps a 1 or 2 with young dogs. Dennis: Do you actually use a 1? Bill: I tell people to start there, primarily to get their timing correct. A 1 might do something with a tiny dog, I don’t know. But, often at a seminar, I get a young lady or some sensitive person to try a 1 on their finger tips and mostly they say they can’t feel it. But they can feel a 2. So get the timing with a 1 but there‘s no use in using an e-collar if your dog can’t feel anything. Dennis: Over the years, have there been any “Eurekas” or sudden insights, or defining moments for you? Dennis: Attrition, meaning you wear the dog down or repeat without pressure and say, “let’s try this again” and perhaps again and again. Bill: But, I think that can actually add pressure – perhaps way more pressure than the e-collar is. Some dogs can’t deal with that. They struggle – they are trying but they can’t figure it out. Dennis: Yes, that gets labelled pressure-free because there is no collar involved but often it is considerable mental pressure. Bill: One of the naïve statements that I hear people say is, “I don’t use any pressure, I use attrition.” What they mean is they don’t use the e-collar. I think the e-collar can be far less pressure than attrition, at least for the way I use it and for the kind of dog that I like – one with common sense and one is trying hard. When a dog is trying hard to learn and then you put pressure on him to figure it out – I don’t understand how that is designed to help the dog learn. It doesn’t make sense to me. To say that again: If a dog is trying to learn and you are putting more and more pressure on him, I don’t see how that is helping him learn. I like to say – Okay, you’re not getting it – here is what I want – so I show him how. Dennis: And I see that often you will do that after the first instance. Bill: Yes, if I see a dog is trying, I will say right away, “No, this is what I want.” This might mean moving up, rethrowing – whatever. I want to make it quick and easy for the dog to learn something. I like dogs that learn quickly. Dennis: Does that approach change when you are dealing with an Advanced dog who has been taught a lot and you feel should have known better. You did a lot of work, you thought the dog understood but now he’s not making that effort. Bill: Well when they are learning you have two things – you have reinforcement of a command and you have a correction. Many times, when they are older, they know the command and they are not doing it and you have to make a correction. So then you have to decide what kind of correction is going to be appropriate to make it clear to the dog that you don’t want to have too many more of these corrections coming up. Something that says – I don’t want that, I want this! How you do that has to be different for almost every dog. One dog needs some Indirect Pressure, one needs to be recalled, and another needs to be moved up. Dennis: So that depends on the history and nature of the dog? Bill: Yes, the type of dog and who has trained the dog and how. Is it one that I have brought up or one that I don’t know about? A confusing situation is where the dog is making a mistake and you don’t know the dog or why it is doing what it is. You don’t know how to go about teaching it to not make the mistake. Now you might be experimenting and that is often not a good idea. Dennis: These days, your name is associated with two things – your National Derby Championship record and your recent series of training videos. Most notably, your Puppy training video has had a big impact on a lot of people. A lot of people are doing more with their younger puppies – I mean way before 6-9 months, perhaps starting at 7-10 weeks. You are now doing more seminars where you see the results of people using your methods. What are you seeing with these people? Bill: There are two things that are gratifying based on what I describe in my puppy training DVD. One is that there are many non-professionals, including those training their first puppy, that are able to follow that material and feel like they have done something well. They have a puppy that’s trained to sit and retrieve and they have done it themselves without any coaching, without others and on their own. That makes me happy. The other thing is that I’ve had feedback from a lot of professional trainers that this is great. They are getting pups in that know their name, that can sit, that come when called, that can retrieve. They are ready to go into formal training. They used to say I didn’t want to do anything to ruin him but they have done something alright. It’s like putting a child in the closet until he’s two. Now for me, this experience has given me a chance to develop these ideas even further and try to figure out ways to make it clear about what I am talking about. Dennis: Have you not actually evolved and modified some things as a result of your videos? Have you changed what you do because of the feedback and watching others? Bill: Yes, I have changed but maybe not because of watching other people but because I am focusing on this topic and working on it. The two biggest developments have been teaching the “here” command which I was very reluctant to do. I didn’t want people to use the “here” command before the “sit” command was solid enough. It would teach a puppy to anticipate the movement from the sit and be on the edge because of it. Now I like to advise people to teach the “here” command but not in conjunction with the sit – so, not when the puppy is sitting but when the puppy is just running around and not paying attention. But it is not “Sit-Here.” That’s a huge distinction. Another thing I am stressing now is teaching the “fetch” and the “hold” command. It’s a good idea to be working on that right from the beginning even though you are not demanding very much. But you are introducing it so that when they are 4 months or whenever you think they are ready, later, they almost already know it. Dennis: I hear you saying that before you would teach hold first and although this involved fetching that you didn’t use the word “fetch.” But now you are actually using the word “fetch” when encouraging the fetch. Bill: Yes and because of the excitement factor the way I do it, they are fetching. They are not fetching “on” command but they are fetching “with” the command. 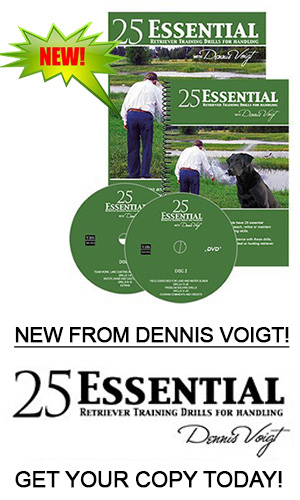 Dennis: I see an adaptation from the method shown in your puppy DVD to the method detailed in the Fetch Command DVD. Bill: Yes, in the first Puppy DVD, I showed escape/avoidance training. I didn’t know how many people could get the timing correct in the way I do it. It was a struggle in the way I do it and I didn’t want to present two versions initially. I have learned that if people can learn to really get excited and get their dog that way, that they can develop the timing. It’s far more pleasant than other ways. Dennis: I have now watched all 6 of your videos multiple times each. I have written reviews on all of them. First, there was the Puppy DVD, and then one on using the soft collar approach on pets. Next, there was the Fetch Command as we just discussed and then Traffic Cop which is essentially reinforcing sit and a form of collar conditioning. Now you have two more, Fundamentals on Land and Fundamentals on Water. These are what some might call your Basics program. I have often noted that, in addition to learning your methods and techniques, if one watched these videos and listened carefully, you would get a insight into your philosophy and approach to teaching and training dogs of all levels. So let’s talk about that. Many people seem to focus on the procedure details, like how far out do I put that pile?, how many times do I send?, how often should I nick? Do I have to have 7 or 5 in the lining drill? That’s what they think about and focus on. But isn’t the more interesting and valuable stuff the process and the philosophy? You’ll say things like, “I am trying to get him to focus on me.” You are not saying, “I am trying to get him to line!” Or you might say, “I am trying to get him to react to me.” So talk to us about this. Bill: You are talking about my philosophy and so far I have not outlined that. But I can tell you that the predominant aspect to how I train is that I want the dog to enjoy the work. I want the dog to be a brave, strong, confident, well-trained dog. I do not want a dog that operates out of fear or is scared. When I see it, I don’t like it. My general philosophy is to teach a dog how to do something and then repeat until he knows how to do it very well before going on to the next step. I am not interested in training any other way. In other words, if I don’t ever win another field trial, if I’m not successful, fine. But I am not going to have anybody witness me being unfair to a dog. Dennis: The end will never justify the means! Bill: Not to me. So am I going to be critical of other people? – Yeah, because I don’t like it! The best people in life that I know have certain human standards and if they train dogs those are the kind of people I like to be around because they often train with a similar philosophy. I don’t want to be around screaming dogs. That’s my philosophy about training dogs. The other thing, though, is whether the dog is a field trial dog, or a hunt test dog or a hunting dog; whatever, I want the dog to be a part of my life and not just in the kennel. On the other hand, there are house dogs that are so untrained they are a nuisance. I don’t want that either. They dominate the comings and goings of the family. So I don’t want a dog that dominates my life but just be a part of it. I am not signing up for the dog to be the head of the household. Dennis: I also love to have a dog that is part of my life, spending time in the house and doing things together besides training. However, one of the challenges that I find and I think it is true of many Amateurs is the issue of Standards. High “one command” standards in the field are a real challenge to maintain in the house and around the yard. Whether this is because of other family members not enforcing your standards or whether it is because of casual airing and carelessness in the house, it is real. I think it erodes obedience in the field all too often. Bill: There are two words that you have to use. One is standards – that is your level of excellence that you are going to accept. And then, there is the consistency that you are going to use to achieve that. You can have extremely high Standards but if you are not consistent in requiring that level of performance, you are not going to get it. What I have seen is that sometimes people in the field have a very high standard but when the dog comes home and is in the house, the standards deteriorate to the point where they erode all your field standards. Now we have a dog that lives with inconsistency. He is basically a confused dog that has to figure out when the standards are high and when they are not. Dennis: I find they figure that out really quick. Bill: Yes, but if you want a dog that behaves like your high field standard, then you can’t say sit 3-4 times. That would be a good example of “poor” training. You have to make a decision about what standard you are going to have. For me and my own way of living I try to be consistent. I try to keep my voice the same; I try to use one command instead of 4-5. I want the dog to execute that command whether he is in the field or the home. It is more difficult in the home. It is difficult enough that most dogs live under two standards. Dennis: Some dogs seem to understand the context of where they are operating. I have seen some that are pretty awful at home but pretty good at the trial. I have seen some Pro’s dogs that barely listen at the kennel and in the airing yard but are obedient at the line. Bill: Yes, but how do we know that they wouldn’t be much better in the field if they had total consistency? I don’t think there is any value in being inconsistent. A perfect example is some of the Obedience dogs that heel perfectly in certain situations but not in the field. It’s not that they don’t heel; they can’t heel in certain places! They need a rope. That’s just an example of the effects of inconsistency. Dennis: Let’s talk about the dog that displays a lack of obedience in the field for whatever reason. Perhaps, you were inconsistent or, perhaps, you never did teach him or he developed a bad habit. Now, they have this behaviour that sometimes they do, and sometimes they don’t. You talked earlier about your use of the e-collar with a relatively low intensity to reinforce a command, for example, as in “sit” nick, “sit” nick. But, let’s talk a 5 year old dog. Are you still using a low 2 for common problems like lack of obedience, not heeling to line, creeping and such in the field? Do you never use a level 4 or more? Bill: In the learning process, I use the electric collar to reinforce a command that they have been taught. That is called reinforcement. But later, inevitably, a dog is going to make a mistake. Then you need to do a correction – so that’s a different thing. That’s a big topic – what do you do about it? Let’s say a dog is sitting and gets up and walks away. What’s the correction? Some people might holler at the dog. Another might run over and shake him. Another might use the “here” command with the e-collar and get him back and act mad – “Now I told you to sit!” – and then reinforce the sit again. So you have this Punishment, and Indirect Pressure and Reinforcement and Pressure and all wrapped into one huge unpleasant situation. More exquisite training might involve quietly bringing the dog back to where he was, and reinforcing the “sit” command like you taught him. Or, using Indirect Pressure you might put the dog on a rope and do a ten minute obedience session and bring him back and see if he does better. There are a lot of ways to handle a correction. But you have to find ways that you think will benefit that dog the most and not make you feel that you reacted by getting angry and making a correction. What are you going to do so that dog doesn’t make that mistake again? And can you do it without deteriorating some other aspect of his training. You might have him acting real nice and everybody says, “now you have him right on the ball” but have you done any damage with what you did? Have you made it more difficult to do some other command? Have you made him scared of you? Who knows what you have created? So these corrections are not as simple as people want. Unfortunately, it is not that easy. Dennis: Often, we see these examples of inconsistent behaviour because the dog is in an exciting environment. This may be other people, other dogs, at a hunt test or a field trial. What are your thoughts in dealing with issues that only show up seriously at trials? At home, the dog is cool, calm and collected and is an A-1 student but he is not on game day. Bill: This idea is about training a dog that must perform in an exciting place, even if it’s a duck blind with 20 mallards coming in or it’s a hunt test with guns going off everywhere, or field trials or lots of people. If that’s the environment that you are trying to compete in, doesn’t it make sense that in a training situation you need to create that excitement – at least, the same excited attitude in the dog? You may not have 20 mallards flying in but you can get the dog as excited as possible when you are doing your training – as opposed to making your dog behave so perfectly from the absolute moment he gets out of the vehicle. He is sat down, he is strapped up with his electric collar, he‘s got a leash on, he is heeling around. He never gets to release any energy. He never has an opportunity to see the joy of releasing his energy and then seeing the further joy of doing something precise and accurate and get praised for doing that too. Now he’s got two things to compare and both of them are terrific. So that is something to think about when training – creating an environment to train in that is similar, at least in the dog’s sense of excitement, that he’s going to operate in. Dennis: Give us some examples of how you get a dog excited without having 20 mallards come in. Bill: First, there‘s a habit that can be involved where you can make certain maneuvers – with a bumper or a tennis ball or a toy to get this dog excited. You can even use a bird. Anything it takes to get a dog really excited. I don’t want to say insane but the next step down from that. Because that is the dog that you are going to be with at the field trial! That’s the dog that you better figure out how to train. It’s very common for people to say, “He doesn’t do that in training!” Well, he doesn’t – he couldn’t possibly because he is under such wraps. It’s like he is carrying a 100-pound bag of rocks wherever he goes. Dennis: Yes, these dogs have so much built up internal excitement that never comes out except when you don’t want it. In training the pressure helps keep it in there. In horse training, some of the more astute natural horsemanship masters are teaching that when we add pressure to the horse in training, it creates energy in the horse. It builds as you put more pressure on the animal. And then the pressure keeps the horse from releasing it – sometimes, you get bucked off. I think we train a lot of dogs that way but they don’t buck us off – at least not physically! Bill: Yes! And that’s an excellent example. Dennis: So you are saying it has to be released. The dog has to blow his stack. Bill: Well, if not it’s going to get released at a field trial where you don’t want it. Dennis: That’s when we see the dog over running birds, running all over the field, and they say, he’s just letting off steam. Well, maybe they are! Bill: They are! Is this idea simple? No! It’s complex and it’s hard to do. It requires some thought. But once you do it right you can have a dog that is operating on all cylinders, using all the gifts that he’s been given to accomplish what you want. He’s happy doing it. So why be pecking away at it to get less of him? Shouldn’t we be trying to add more to him? That’s how I think about it. I want to add to what a dog has. I don’t want to detract from how he is. Dennis: You mentioned before that you want a dog that is brave and can deal with these things. Talk about your training where you teach a dog to deal with conflicts because there will be a situation where he has conflicts. Everything can’t be black and white. Everything can’t be “show me.” There are times where he has to figure things out. The onus is on him. One example I can think of is in your Fundamentals video where you are getting the dog to jump over a canoe. It’s not just show me and simplify because you actually want the dog to have some conflict so he can learn to make the right decision and figure it out. Bill: This Bravery thing is my favourite of all the topics. If you are in the military and you need to be protected by a soldier, do you want a brave soldier that is willing to die to protect you or do you want a soldier that is told unless he does it you are going to shoot him. He’s going to do it because he’s afraid to die some other way. He’s not brave – he’s afraid. So why do we keep taking away from these dogs to the point they are scared? How can that scared dog think straight when he has to make a decision? That’s where his dealing with the conflict comes in – that decision to take the last piece of water or bust into cover after he has already exhausted himself. Dennis: Maybe it’s often just a decision to make an effort. Bill: Yes, and I can think of plenty of examples to create more power, more bravery, more strength. I’m much better at saying what I think about that than how to deal with a dog that is scared. I like to stay away from that. Dennis: Give us some examples of fostering bravery in a young dog. Bill: First of all, by making sure you don’t do anything to take away his confidence. Teach him. We have this wonderful knowledge about conditioning – the conditioned response. We can decide what we want him to be conditioned to. We can condition him to be brave. We condition them to love to retrieve. We can condition them to almost anything we want. So concentrate the conditioning process on being brave; not using fear to get him to do things. You can use repetition and many other things to create this bravery but you minimize the things that will detract from that and maximize the things that contribute. Dennis: Some aspects of your program can be considered unconventional or at least not emphasized, compared to other programs. For example, the emphasis that you put on focus, or avoiding high pressure, of not making him afraid, or abundant reinforcement with low intensity nicks and this bravery topic. The goal is a dog that is brave and always willing to try but who also reacts to you rather than does his own thing. I’m thinking about the approach often used to train the willful dog. Those dogs can appear strong, powerful and brave but that’s not the type of bravery that you are talking about. Bill: No, that dog is brave only for himself but he’s not brave for you. Remember the soldier? Dennis: He’s not the soldier that you want. He is the one that says, “I’m out of here!” I like that analogy. Bill: I use it all the time because who’s going to be the better soldier – who’s going to fight the hardest. And who do you want to be with? Dennis: In other words, what kind of dog do you want? Bill: Yes, and I want the dog that is bold and strong and brave. Dennis: I think that is what most judges are attracted to also. He has presence. He comes to line – he’s got charisma! It’s the dog that the gallery says, “Wow, I want to watch this dog.” But the coward dog even if flawless is not very interesting and pretty easy to forget. Good reasons to have the kind of dog that we are talking about! Note: Our interview continued as we talked about “contrast” in training, practice and its role, how to structure training sessions, and much, much more. Stay tuned for more next issue. Incidentally, elsewhere in this issue you will find an article on judging the High Roller. Have a look as it’s relevant to the type of dog being discussed in this interview. You can learn more about Bill Hillmann’s videos and information on his training methods at www.hawkeyemedia.net and www.billhillmann.net.